Grocery shopping has never been a chore for me. I love the clean lines, shiny packages, and bright coloured fruits and vegetables. I stroll the aisles looking for new products, check the sales (and those awesome 50% off stickers), and generally plan meals while in the store. I tend to shop at the Independent because I try to buy as many organic and natural products as I can. Somebody has to save the planet with all you people leaving the water running while you brush your teeth! Emile ruins the system: wandering all pell-mell, distracted by the bright colours, putting things in the wrong section of the cart, and tempted by all the things chocolate. But yet, I like taking him along for some time together. I particularly like grocery shopping in the middle of the week during the day. It’s me, the stay at home parents, the seniors and the staff. Usually no line-ups, lots of stuff on the shelves, and no near misses with carts coming around the corners. I had to read this several times to understand it. What? You don’t take anything except debit and credit cards? Huh? 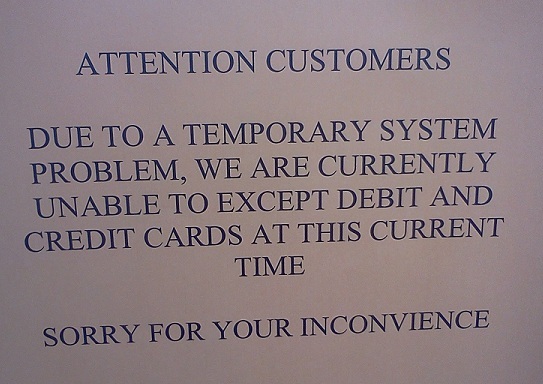 In fact, so distracted and horrified by the first paragraph, I didn’t even notice the spelling of “inconvenience” until I posted this picture into this blog. Earlier that day, I just read this blog about texting and how our children can no longer spell, use punctuation or understand basic grammar. I too am guilty of using “u” instead of “You”, and “ive” instead of “I’ve” when I am texting on my phone. But when presented with a keyboard, I type it out fully. Yes, okay, I struggle with “passive voice” issues, and sometimes not totally use whether to use “whom” or “who”, but I’ve got the basics down. I run spell checks, I try my best. I hadn’t expected to see proof of the blog’s assertions so quickly! I entered the store and asked a girl about the ETA of the systems being back up. She didn’t know, but another person told me it was ALL of the stores. Can you imagine? All of the Loblaws (presumably) could not ACCEPT debit or credit cards yesterday for a some period of time. Galen must be terribly upset. I had $10 and a $10 Canadian Tire Gift Card on me, and I certainly wasn’t paying a $1.50 to use the PC Financial ATM. And I was affronted by the signs. So? I left and headed to Fresh (the discount grocer in town) and was pleasantly surprised on prices and some organics being available. See you, Fresh and I’ll bring my credit card again.